The official Dropbox app for Windows 8 is now available in its app store at zero cost. You can easily locate this Windows 8 Dropbox app under ‘Productivity’ section of the app store. The Dropbox app lets you easily configure your Dropbox account and sync all your Dropbox files & folders with this app. You can swipe towards the right and can browse all your Dropbox files, folders, docs, watch videos, view images stored on your Dropbox account, in just a single click of button. In addition, you can also share any file or folder, any photo with others, from within the app using the Share Charm. Also, users of your Dropbox can open a file, edit it, and save it, immediately. The Windows 8’s Search Charm is integrated with this Dropbox Windows 8 app and hence, you can use it to find any file or folder (stored on your Dropbox) you want. Now, those who have no idea about Dropbox, then let me tell you… it’s a free service that allows you to bring all your files & folders, docs, photos, and videos placed anywhere on your local machine, to your Dropbox account. Basically, it’s a cloud storage service that you can access anywhere, anytime. All you need is Dropbox. And the most awaited Dropbox app is now available in the Windows 8 app store and that too for free. Let me quickly point out the main features of this Dropbox app for Windows 8 below. Lets you configure you Dropbox account and sync all your files, folders, photos, videos, etc. with this Dropbox app. 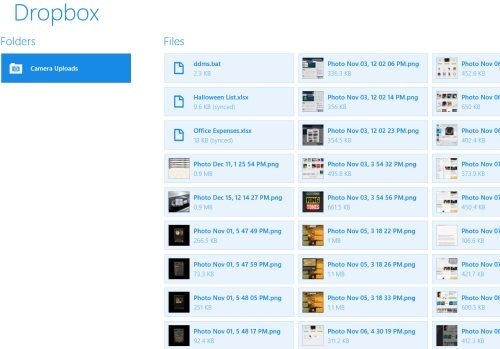 Browse all your Dropbox files and folders in just one click. With just one click on button, you can open a photo, doc, video, or anything. Lets you upload files from other apps. Lets you open a file, edit it, and save it immediately. Lets you share any folder, photo, doc, etc. with others, from within the app, using the Share charm. Integrated Search Charm lets you find any file, or folder, stored in your Dropbox account. Well.. I really liked this Windows 8 Dropbox app.. you can access your Dropbox account without downloading Dropbox on your desktop. It’s very easy and fast to access your files and folders, stored on your Dropbox account, using this app. 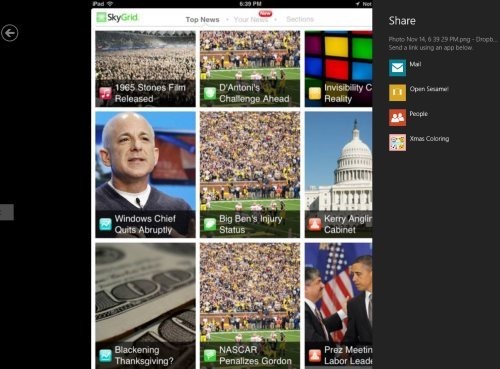 It’s a must-have Windows 8 cloud storage app. Also, check out our posts on ZipCloud, Box, and Box File Provider. Open this link strictly in IE10. You will find the link opened in the app store from where you can install. Proceed with further installation steps and get the app now. In short, Dropbox is a good utility cloud storage Windows 8 app where you can bring all your files and folders you have in your local machine and can access to those, anywhere, anytime. Go ahead and download Dropbox app in Windows 8 now.